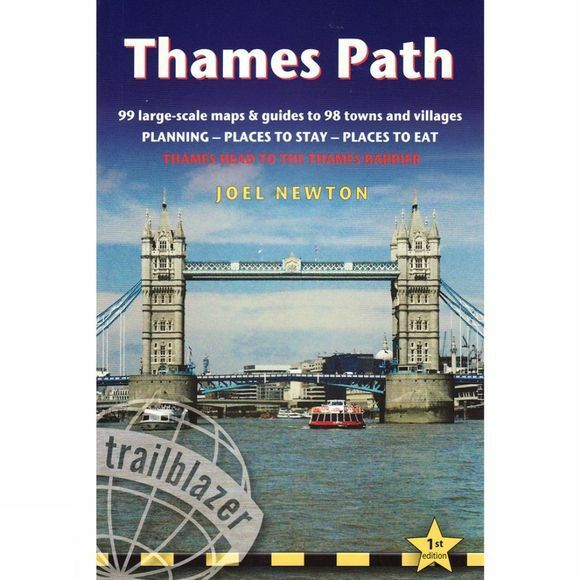 Practical Trailblazer walking guidebook to the Thames Path National Trail running for 184 miles from the river's source at Thames Head near Kemble, Gloucestershire to the Thames Barrier in London. The path leads from the start of the river in a meadow in the Cotswolds through Oxford, and further historic towns, churches, abbeys and castles including Lechlade, Abingdon, Wallingford, Henley, past Runnymede, the site of the signing of Magna Carta, and Windsor Castle. Passing by so many ancient sites, this is as much a walk through history as an easy ramble along a river bank. The route through London – particularly along the south bank – remains relatively countrified, at least as far as Putney, from which the approaching sights of Westminster and Tower Bridge offer vistas as impressive as any others along the river's green and scenic upper reaches. Leaving central London, the regenerated dockland areas of East London lure you to your journey's end at the Thames Barrier and the conclusion of a most enjoyable and easy ramble. Includes; 99 large-scale walking maps and town plans; public transport information showing all access points on the path; accommodation and places to eat with reviews; colour photos including colour flower guide; extra colour mapping – stage maps (one page per stage) and profiles.